Which One Works Better: Ionic or Colloidal Silver? We put your health back in your hands. Finally there is a professional, high quality colloidal silver generator available at an affordable price. 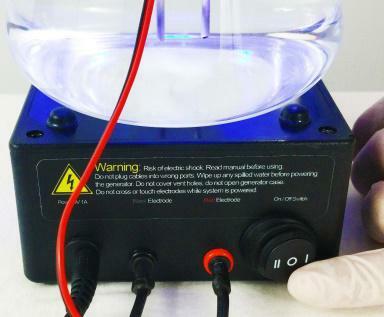 We have created an extremely fast colloidal silver generator. Using a perfect balance of stirring speed, electrical current and dynamic cycling of the electrodes our generators create a perfect batch of colloidal silver in an extremely short period of time. Our finished colloidal solutions have an outstanding Tyndall reading and a high parts per million count. We understand that quality is a big part of a colloidal silver generator purchase. We have done thorough testing on our products and the colloidal silver solutions produced them. In our real world testing, we took one of our generators and subjected it to generating 150+ batches back to back with zero failures and an outstanding colloidal silver solution produced every time. With average usage, that comes to over 12 years of generating colloidal silver worry free! We hand build our generators using quality parts assembled by skilled and qualified technicians. All of our generators go through rigorous testing during the assembly process. These test results and checklists are included in your package order. 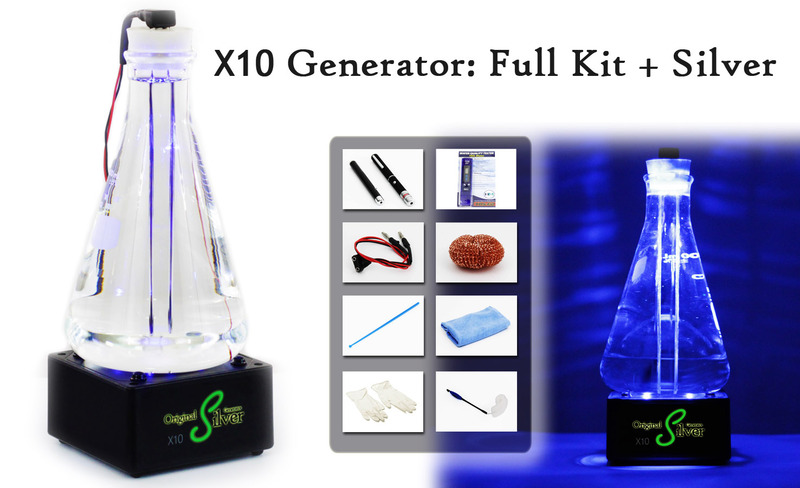 Here is a video displaying our flag ship product the X10 which creates colloidal water at 10ppm. We Don't Milk You For Money! We are not interested in milking you for money! We do not sell falsely proprietary reducing agents that would require you to repeatedly come back to use far into the future. We have also taken the time to create an anti-shock connector that ensures, under normal use, that no permanent damage is done to your generator and also protects the user from possible electric shock. We have also included a secondary stirring function on the power switch that does not send power to the connector ports or cables. This ensures that it is not possible to make a minor mistake like touching the electrode wires together which could completely wreck your generator! These types of safety measures have not been addressed by other company’s! We only use 3rd party 9999 certified silver rods, it is very important that the silver be as pure as possible to ensure the best possible colloidal silver solution. All of our silver rods are shipped with the certifications showing that our silver is 99.99% pure silver. Don't make colloidal silver with anything less! 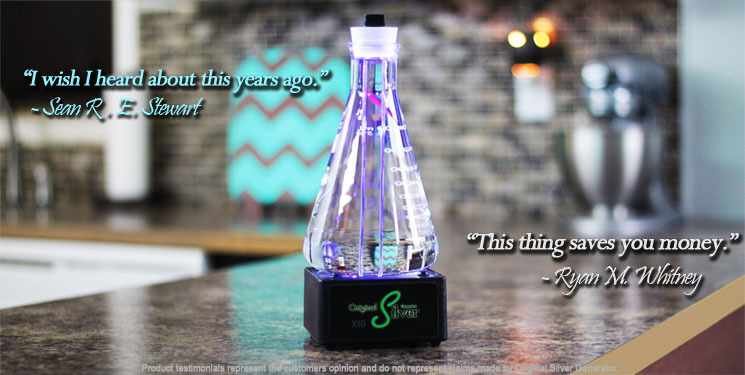 With perfectly scripted monitoring circuitry and illumination during the generation process, our generator is programmed to “set it and forget it”, turning off the circuitry, lighting, and stirrer when the colloidal water batch is complete. We have maximized every batch of colloidal silver generated by exceeding the standards of other companies. The most important part of a colloidal silver solution is the ration of particle sizes. 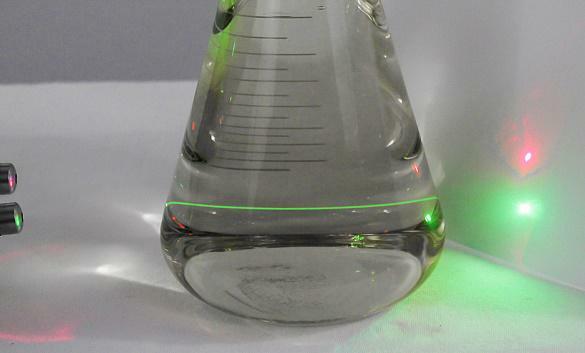 Shining a laser through the flask will show a beam of light revealing the size of the silver particles. This method is called the Tyndall effect and it is the fastest and most widely used method of measuring particles size. The key is the color of the laser beam being used. Red is the largest wave length at 650nm, any silver 650nm or larger will reflect the red laser because the light wave cannot go around the particle. This, in turn, will contribute to the thinness and intensity of the visible beam being seen in the flask. To put it simply this is a very bad thing, seeing a thick red beam indicates that there are too many large fragments the in the solution. A solution with large silver particles will be less effective or may even be dangerous depending on the intended use. All other companies we have researched use only a single red laser beam to display particle size. What you may not know is that without a contrasting secondary laser beam it is almost impossible to get the true percentage of very large fragments present in your solution. To put it simply, other companies can hide the short comings of their products by depending on one red laser beam to display the ratio of large silver fragments. Our generator creates a far superior silver solution that is backed up by the provided red and green lasers. Green has a very tiny wavelength of 532nm, this is vastly smaller than the red laser. Any silver particle in the solution that is 532nm or larger will contribute to the observable green laser beam as it goes through the flask. It is only by comparing the red and green lasers do you see the true ratio of large silver particle to small. As you can see in our silver batch there are almost no added silver particles to the red beam and a very high percentage of silver particles added to the green beam. This ratio shows that almost all of the silver particles in our solution are less than 650nm in size. This is extremely hard to accomplish especially at the blazing fast generation speeds of our generators. To sum it all up. We are faster, generate a better colloidal water product and are a lot less expensive than the other guy. With everything we do, we believe in challenging the status quo, we believe in thinking differently. The way we challenge the status quo is by making our products beautify designed, simple to use, with an extremely high quality. We just happen to make great colloidal silver generators. I have used Colloidal Silver for a long time. I was just wanted to know at what price can I make my own. Hello, Thank you for visiting our site! Here at Original Silver Generator we offer fast, modernized, high quality Colloidal Silver Generators. We have found, in our research, that we are less expensive than the other guy for the quality of machine being purchased. With our generators a person can make hundreds if not thousands of batches of silver for next to nothing. To break it down further, each batch requires 1L or 32 oz of distilled water and one micro scoop of reducing agent. I can't give you an exact dollar quote as these item's costs may very depending on where you are located. As a general reference it would cost around $0.25 to make a 1L or 32 oz of True Colloidal Silver with our generators. From everyone here at OSG thank you for your question. Hello Donny, I see you have already seen this, but for other people, we have a video that can help explain the advantages of our products. 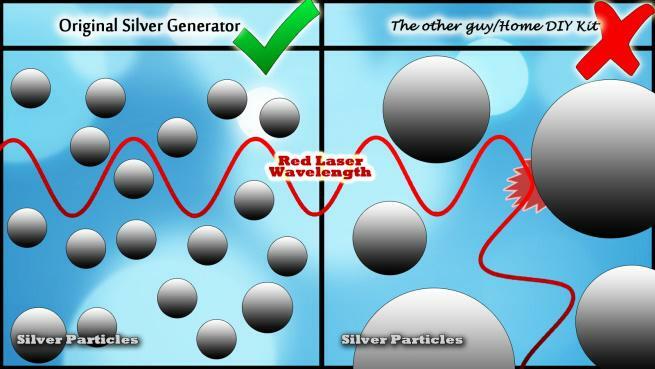 http://original-silver-generator.com/original-silver-generator-videos.html Some of the things I want to mention in this post are: Through our research we have found our product to produce a colloidal silver solution that has smaller particle sizes (proven by our tyndall readings in our videos) than the other guys. We are the only company that we have found that uses a green laser (532nm) to measure the particle size. Other companies use a red laser (650nm) to show their larger particle size. With our smaller particle size, you can barely even see the tyndall with a red laser because the particles are so small. We have also found that our generator is extremely fast, producing minimum of 10ppm in 90min. One other feature we wanted in our generator was a dedicated 2nd stirring function for adding the reducing agent. In this setting, only the stirring magnet is powered and creates a vortex that thoroughly mixes the reducing agent into the solution. The cables that run from the generator to the flask (for colloidal silver production) are not powered. So you don't need to worry about the cables (or the cable ports) being powered when you are not using them. The other guys are not as dedicated to safety as we are. 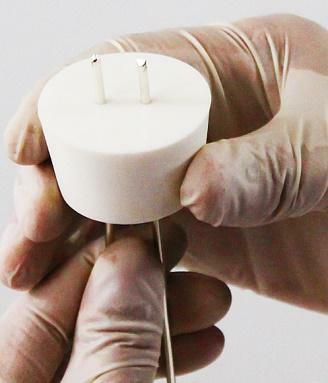 We have also incorporated a proprietary anti-shock connector that virtually eliminates the risk of electric shock or doing permeate damage to your generator. Also, we don't hide behind false proprietary reducing agent. They want you to spend extra money and buy their "Secrete Proprietary" reducing agent... even going as far as to tell you that it will only work with their product. We don't believe in this sales tactic. We are upfront and give you options, like powdered (or in a capsule) 100% Grape Seed Extract or powdered (or in a capsule) 100% Cinnamon Extract. Or, for people who don't want to add a reducing agent, you can heat up your ionic solution to reduce it to a colloidal solution. We have found that heat is not as efficient as the other 2 methods, so we don't generally recommend this option, but it is available. These are the main points I wanted to touch on, but as you can see we have spent a lot of time developing a product that reaches beyond the limits of our competitors. From everyone here at OSG thank you for your question. Hello OSG, Thank you for more info. re: the 2 necessary lasers and the Grape Seed extract. How much GSE do you put in 32oz of distilled water? And is that added before or after you make your CS water. I've researched many websites selling CS generators. I'm totally confused as I'm sure other potential buyers also are reading sooo many conflicting issues that you might answer please. 1) To start with most CS sellers state that a low voltage is best. A few other selllers state it's proven that a higher faster voltage is best. 2) Also in opposition, some makers say the CS water after generating should be a golden or amber color end result, and other makers state the CS water color end result should be clear. 3) One website states the rods need to be 6in. and almost reach the bottom of your glass maker, while others may use 4in. half way into jar. Also the gauge of rods differs. 4) Some state 12 guage and some state 14 gauge etc...and another states the double U rods are proven best. 5) Most state the air bubbles are necessary and others state stirring is enough. The faster voltage sellers state you don't need to clean rods or build up, as many lower voltage come with the scrub pad for rods. For being such an easy process as it appears, this is CSC = Colloidal Silver Confusion for me. I appreciate if someone would call me? Thank you!!! No information about the price ? How much cost the Generator ? Thank you for your interest in our products. The top right link “Buy Now” and the links “View Our Generators” will bring you to our generator’s page where you are able to view pricing. We are offering free shipping when you share us on Social Media. Buttons on the generator’s product page will help you share the page and receive a coupon code for free shipping. From everyone here at Original Silver Generator thank you for your question.